Can be used to connect chain to stake. There are several uses, heavy duty, non plated, can be dyed and waxed. Small fits 3/8 stake. Large & extra large fits 1/2 stake. Heavy Duty Double Stake Chestnut Rings are 4 x 1 1/2 and are excellent for cross staking rebar or looping chain through to wrap around a tree or post. Stronger than S-Hooks. Can be added to stake end of trap or snare with no tools or welding. Best connecting link anywhere. Works great for snaring small to medium sized animals. Not recommended for anything larger than a coyote. For large coyotes you may need to use 2 rings for added strength. Small split Ring 1 1/8 inch in diameter. 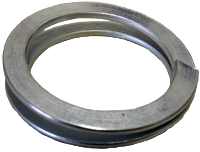 Large Split Ring 1 3/4 inch in diameter. Jaw opens 1/4 inch. Zinc Coated. The 3/16 inch size and the working load limit is 440 lbs. The 1/8 inch size is 1 1/2 inches long with a working load of 220 lbs. 3/16 spring gates snap link. Great for anchoring snares to post, trees, or brush. Ideal for the trapper and snare-man. 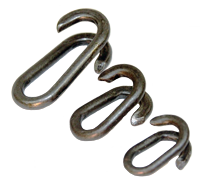 Use for attaching chain to super stake ends, anchoring or extending a snare. 100s of uses on the trap-line. The Heavy Duty S-Hook is designed to fit over 0.5 inch rerod without binding.